British divers Adam Drzazga, Tim Money and Carl Atkinson, with Adam Mustoe in reserve, formed the men’s team, finishing in 8th place behind winners Czech Republic, second place France and third place Russia. Georgina Miller and Beci Ryan formed the women’s team, however Beci was unfortunately injured in training and didn’t compete, however she became a valuable team coach and assisted the organisers. Well experienced at top-level competition, Georgina gave three impressive performances including a new personal record in dynamic on the final day. These World Championships are a team event, and everyone needs to work together to get a good result. The men’s team discussed a strategy and aimed at good, but not reckless, announcements in their depth dives (known as constant weight). Carl Atkinson, at his first World Championships, dived to 80m and Tim Money to 63m. Adam Drzazga reached 55m but unfortunately got a red card due to a technicality. Georgina Miller reached 51m. This added some pressure on the men to “go big” in the next event, static apnea, which was Adam’s strongest and the team decided to be more aggressive with his performance to try and claw back some points. Carl achieved 4:57, Tim 5:47 and Georgina 6:31 which put her in 4th place for static amongst the ladies. Unfortunately, the men’s team strategy didn’t work, and resulted in a disqualification for Adam, so the team regrouped and ended in the final event dynamics with strong performances and white cards across both teams – 167m for Tim, 141m for Georgina, 130m for Carl and 123m for Adam. Despite some setbacks, the British team enjoyed the calm, relaxed and inspirational atmosphere at the event. The race for gold in both sexes gave a nail-biting finish. The Japanese women’s team all pushed themselves to personal records to win gold, followed by the Czech Republic in second and Russia in third. Martin Valenta (CZE) swam 250m dynamic to ensure his men’s team won. 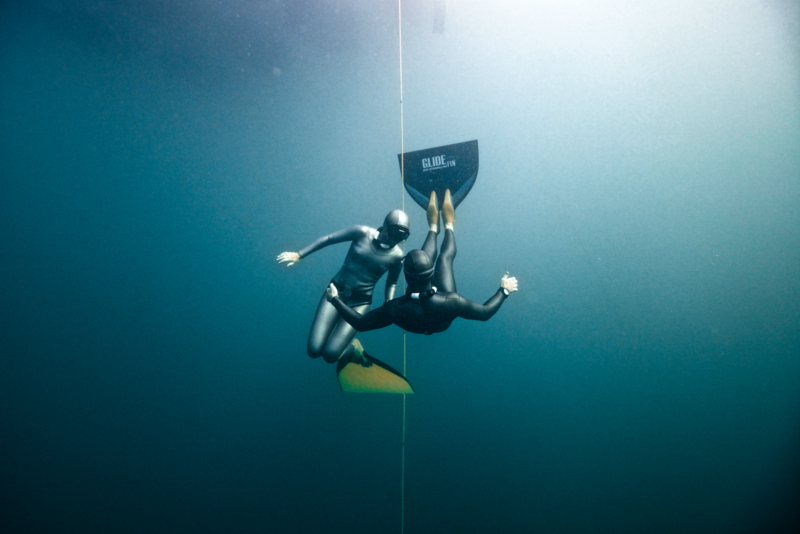 The British freediving team was kindly sponsored by Elios, DiveSangha, Saltfree divers and Orbiloc dive lights. The Individual AIDA Pool World Championships ran from 21st to 27th June in the city of Belgrade in Serbia, with 122 athletes from 27 countries in attendance. A team of eight British athletes made the trip to represent the UK and fly the flag: Adam Drzazga, Alice Hickson, Beci Ryan, Georgina Miller, Jason Kirkpatrick, Lucelle Simms, Rebecca Coales and Shirley Turner. The team was made up of seasoned and novice athletes alike. Despite it being an individual event the athletes worked together as a team, offering competition advice and coaching one another’s performances. All the athletes on the team are self funded and this year they were grateful to receive sponsorship from Divesangha, Bounce Energy Balls and Beet-it shots. From the onset the team looked strong, with three athletes, Rebecca Coales, Georgina Miller and Beci Ryan holding wild cards (meaning they ranked top ten in the world for one or more discipline), and Jason Kirkpatrick and Alice Hickson having won best newcomer at the National Pool championships in March at the Great Northern. But no one could have predicted that a 25-year-old, Swim Coach and Occupational Therapist, who had been freediving 8 months and this just her second competition, would break three national records, win a gold and bronze medal and become a World Champion! But this is exactly what Alice Hickson did with ease, grace and humbleness. On day one Alice came out and performed like a professional, breaking the UK national record in dynamic no fins (DNF) by swimming 153m (the previous record was 145m set by Rebecca Coales) and securing herself a place in the A-Finals. In the A-Finals Alice continued to impress by adding almost an entire length onto her previous performance, 21m to be exact, and coming up clean and strong at 174m; winning her a second national record, a gold medal and the title World Champion. It was in static (STA) that Alice went on to win her bronze medal. In the qualifying heats, despite the challenging cold conditions, which put a number of other athletes off, she held her breath for 05:58. In the finals she increased her time to 06:58 and broke her third national record. Georgina Miller had set the previous static national record at 06:33 at the Great Northern on 22 March this year. There were some strong performances from other members of Team GB, with Georgina Miller qualifying for the STA A-Finals and now ranking number 7 in the World. Shirley Turner and Adam Drzazga made the STA B-Finals and rank number 10 and 11 in the World. Beci Ryan qualified for the DNF and STA B-Finals. Lucelle Simms narrowly missed out on the DYN finals with a solid 166m swim. Jason Kirkpatrick at his first World Championships and his second ever competition did brilliantly, his performance in DYN was impressive, swimming 124m in bi-fins, not an easy feat. With the Pool World Championship over, we now look forward to the AIDA Depth World Championships in Limassol, Cyprus. The UK Team and sponsors will be announced very soon, so watch this space! year was no different. Living up to the International bit of the title, fourteen countries were represented, with one athlete, from team USA, Mandy Sumner flying in from Hawaii the night before the competition! Keeping to tradition, national records were set, this year both British, over the course of the weekend. On day one, John Moorcroft, the first diver of the day, kick started the competition with a record in dynamic no fins of 176m and on day two, Georgina Miller set her record in static with 6 minutes and 33 seconds. John swam just over 7 lengths of a 25m pool on one breath with no fins, smashing his previous record of 167m, set at l ast year’s competition. Georgina Miller’s previous record was 6 minutes and 27 seconds set in 2014 at the 7th Mediterranean Freediving World Cup, and she pushed it a further 6 seconds away. The UK male winner was Dan Betts with three strong performances, white cards and big smile at the end: 115m DNF, 05:39 STA and 151 DYN. Coming in second for the Brits was Josh Walton of Bristol Freedivers and in third Jason Kirkpatrick from the Glasgow Apneists UK group. In first place for International male Matej Bergoc of Slovenia with incredible holds: 140 DNF, 07:07 STA and 183 DYN, in second Stephan Heiss and in third David Fournier. The UK female winner was Beci Ryan with 135m DNF, 05:12 STA and 150 DYN, in second Georgina Miller and in third Lucelle Simms. And Masa Sorn also of Slovenia, training with Apneists UK Yorkshire group, came in second place for International female with three strong performances (104 DNF, 04:46 STA, 150 DYN). The winners of the Newbie Awards were Jason Kirkpatrick (05:17 STA) and Alison Hicks (151 DYN), with already impressively big holds and swims and a lot of promise for the future. Rumour has it that both athletes look set to join the UK Team at the Pool World Championships in Serbia! The Great Northern is a competition that celebrates achievements across the board, it recognizes that freediving is not always about numbers and times but about personal achievements and obstacles overcome. The sense of atmosphere at this year’s competition spoke volumes, with athletes from clubs all over the UK and indeed the world, coaching, congratulating and celebrating personal bests with genuine enthusiasm. 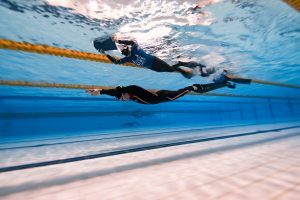 On Saturday 29th November, Rebecca Coales, trained by Steve Millard of the freedivers.co.uk group, extended her own national record of 179m in Dynamic apnea, to an impressive distance of 186m, at Grand Central pool operated by Life Leisure (www.lifeleisure.net). Rebecca’s underwater swim with a monofin took 3 minutes and was overseen by internationally qualified judges from the main Freediving agency, AIDA International (www.aidainternational.org). 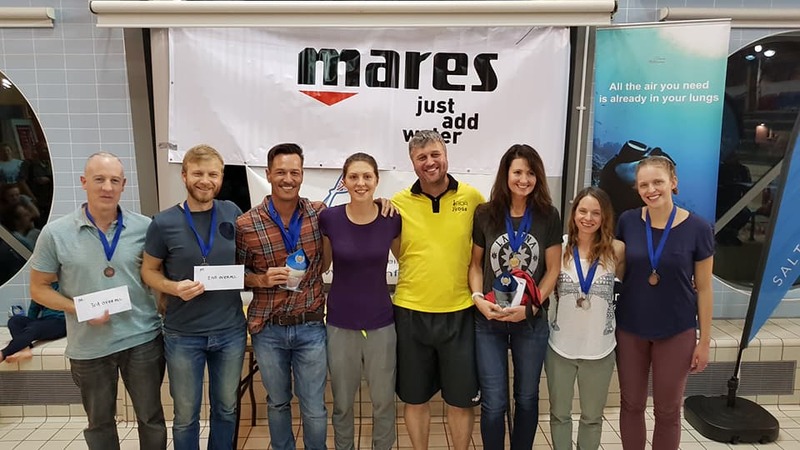 The national record was part of a larger competition, where athletes from around the UK and representing a variety of nations, came to Stockport to compete in one of three disciplines: Dynamic apnea with fins (DYN), Dynamic no fins (DNF) or Static apnea (STA). In DYN the athlete swims the length of a pool as far as they can on one breath and with the use of either a monofins or bi-fins; with DNF the athlete swims a style of breast stroke under the water without the use of fins; and with STA, the athlete lies stationary, face down on the surface of the water. Rebecca won the overall female competition, but an excellent swim by Beci Ryan of 163m was a very respectable second position. In third place was Scottish number one no fins diver, Katey McPherson, with a swim of 107m DNF, no mean feat in a 50m pool which is much harder than the usual 25m pool as you do not get the benefit of as many push offs from the wall. Adam Drzazga won overall for the men, with a 136m DYN swim, in second place Lorenzo Baldecchi for a 05:07 STA and in third place was Hungarian freediving champion Mike Benke. Eoin Clarke swam a solid and easy 104m DNF and broke the second national record of the evening, this time for Ireland! Jason Kirkpatrick was the ‘opener’ and therefore not officially a competitor into the competition, put in a 05:22 STA which would have won the men’s title; after only a few months training in the sport he is one to watch out for. The competition was a small National competition, part funded by the BFA (www.britishfreediving.org), and was great practice for the athletes to get ready for the International competition we have on the 21st and 22nd March 2015 in Liverpool (facebook.com/Apneistsukfreedivingcompetitions). This September (8th to 16th) saw the biggest freediving World Championships so far. To celebrate the 20th Anniversary of AIDA, freediving came home to Nice, France the birthplace of AIDA all those years ago. 120 athletes were supported by a safety and logistics crew of well over 100 people. The team this year consisted of Georgina Miller, Liv Philip (captain), and newcomer Beci Ryan for the women, and Gary McGrath, John Moorcroft and Tim Money for the men. We also had the support of two reserves, James Cluskey and Gary Lowe. Sara Campbell was also there teaching free yoga and meditation to the athletes. The team was very kindly once again sponsored by top Italian wetsuit manufacturer Elios Sub (www.eliossub.com) and team kit was generously provided by British dive fashion brand SevenTenths (www.seventenths.com). The team is also grateful for sponsorship from Oceanic (www.oceanicuk.com), for providing us with amazing new dive computers by Aeris and lava core wear. This company is in exciting talks with the BFA’s sponsorship officer, James Cluskey for a longterm mutually beneficial relationship and we look forward to being able to announce exciting news in the very near future on this front. With challenging conditions both in and out of the water a special mention should be made to Gary McGrath for his impressive personal best of 68m in Constant Weight. Tim Money also managed a new personal best in Constant weight of 60m. John Moorcroft who, after over 30 years in the sport is also still pushing his depths to never-before reached numbers – 67m in competition! Beci also did amazingly well, having started the sport this year, she entered the competition with a spirit of courage and endeavour and, despite very unfamiliar and stressful surroundings for a beginner, also delivered personal bests in all three disciplines! In The pool we saw another personal best in dynamic from Georgina Miller of 133m, she also made 6th place overall in the women’s static, Tim Money also delivered a very strong 169m. Liv, George, and Tim are seasoned athletes who also delivered consistent and strong performances, both competing and coaching the less experienced members of the team, which is a tall challenge at such a big and important competition. A strong captain in Liv Philip, with support, coaching and fabulous photography by Daan Verhoeven and coaching and general care from Stavros Kastrinakis made a difficult event a success.